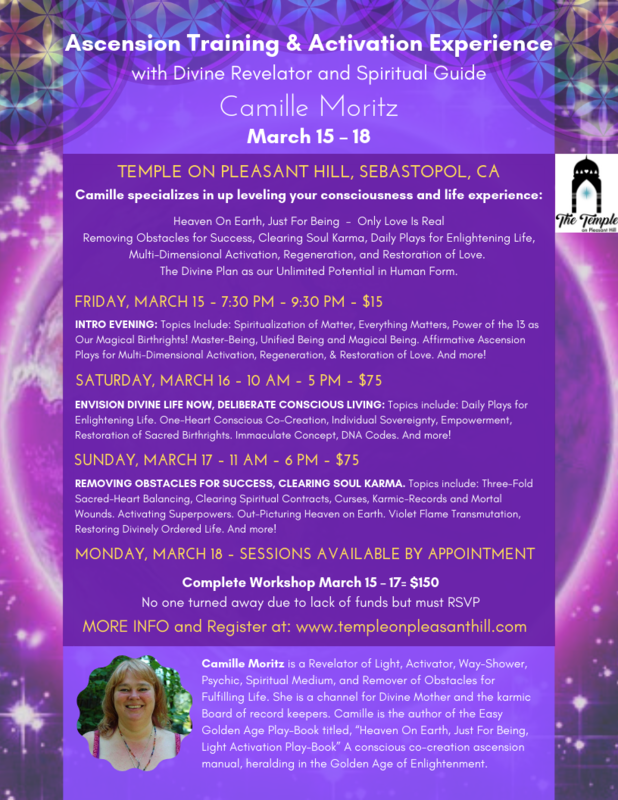 REMOVING OBSTACLES FOR SUCCESS, CLEARING SOUL KARMA, with prominent Ascension Teacher and Guide Camille Moritz, who will offer to in-depth Ascension trainings and experiences in the Temple March 16 & 17, and private sessions on Monday, March 18. Sunday’s topics and experience specifically include Three-Fold Sacred-Heart Balancing, Clearing Spiritual Contracts, Curses, Karmic-Records and Mortal Wounds. Activating Superpowers. Out-Picturing Heaven on Earth. 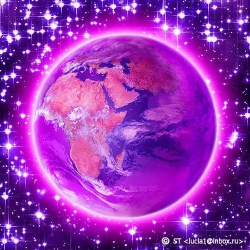 Violet Flame Transmutation, Restoring Divinely Ordered Life. Multi-Dimensional Activation, Regeneration, and Restoration of Love. Multi-Dimensional Activation, Regeneration, and Restoration of Love. The Divine Plan as our Unlimited Potential in Human Form. Heaven on Earth, Just For Being! These workshops will also highlight Affirmative Ascension Plays for Multi-Dimensional Activation, Regeneration, and Restoration of Love. The Divine Plan as our Unlimited Potential in Human Form. Heaven on Earth, Just For Being! Unified Being: Heal the Three-Fold-Flame of our Sacred-Heart. Transcend Duality and Restore Sacred Trust. Activation of Divinely Intended; Love, Power & Understanding. Co-Creator Being: Sacred Science of Manifestation, Affirmative Conscious Co-Creation Formulas for Manifesting Heaven on Earth. Immaculate Concept. Violet-Flame Play-sheet. Master Being: Individual Sovereignty and Self-Empowerment. Magical Being: The Power of the 13 as Super-Powers. Camille Moritz is a Revelator of Light, Activator, Way-Shower, Psychic, Spiritual Medium, and Remover of Obstacles for Fulfilling Life. She is a channel for Divine Mother and the karmic Board of record keepers. Camille is the author of the Easy Golden Age Play-Book titled, “Heaven On Earth, Just For Being, Light Activation Play-Book” A conscious co-creation ascension manual, heralding in the Golden Age of Enlightenment. Camille has a Bachelor of Arts degree in Psychology and Graduate Studies in Jungian Archetypal Psychotherapy & Body-Centered Therapies. She has been a 15-year clinical case manager in traditional centers and has been providing Spiritual, Psychic, Intuitive Readings, and Transformational Soul Healing sessions for more than 20 years. INDIVIDUAL SESSIONS WITH CAMILLE MORITZ: Session provides Spiritual Guidance and Channeled Messages. Messages from Ancestors, those who have passed & Higher-Self. One Heart Soul Trans-Formational, Trans-Dimensional, Activation and Clearing Sessions. Allows the healing process for structural, emotional, mental and spiritual causal body systems. Past-Life Revelation & Recall. Clearing blockages, contracts, & karmic debt from this life, previous lives and cosmic lives. Reset & Activate the Divine Blueprint.